In a large skillet, saute garlic and onion in butter, oil and salt until tender. Add broccoli; cook and stir over medium heat for approximately 6 minutes. 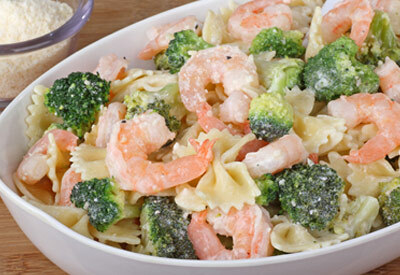 Add shrimp; cook an additional 4 to 5 minutes, or until shrimp is pink and broccoli is tender. Stir in pasta and sprinkle with Parmesan cheese. Save $2.00 on ONE Swiffer Refill OR WetJet Solution (excludes trial/travel size).